Dr. Phuong Tran, M.D. earned his bachelor’s degree from the University of Houston, after which, he attended the UT Southwestern Medical Center where he earned his Doctor of Medicine in 2006. After his time in medical school, he completed his residency and became certified in Internal Medicine by the American Board of Internal Medicine. In addition, Dr. Tran received his Texas State Medical License. Dr. Tran joined Addison Internal Medicine as an internal medicine specialist in 2016. Before joining our practice, he has practiced medicine in North Texas for over 10 years and has published numerous papers on topics like the Physicochemical factors affecting the stability of a pH-modulated solid dispersion and Design and the mechanism of on-off pulsed drug release using nonenteric polymeric systems. Dr. Tran provides the highest quality care in North Texas. 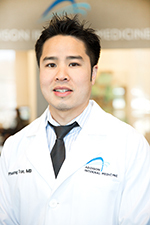 His years of experience, combined with the other expert doctors on staff at Addison Internal Medicine, allow Dr. Tran to provide his patients with the level of care they expect. Dr. Tran is currently accepting new patients. Schedule an appointment today by calling us at 972-733-3090.